Cherry Lane Creative, a Production Co.
Join the Revolution with Florentina & the MyKids Unite© Team to Celebrate Friendships for All! Learn about being a good friend, making new friends and learning Just How Amazing You Are for You and I am For Me! A Unique, Creative and Engaging Inclusion Lesson Plan for Grades K - 12! Adaptable for ALL ages and abilities! Also a great interactive resource for College and Community Organizations who want to build and support Inclusive Programs! Includes US Department of Education Standards. Book Written by Andrea M. Clarke and Inspired by Florentina, an Artist with special needs who just wants to have friends and be accepted for who she is. Bright, colorful illustrations and unique characters, this enlightening story captures the imagination of kids, young and old! Objective: Students will identify why including people that are different than them isn't occurring, why it should, develop a plan to encourage inclusion and implement it. Students will discuss how others can be different and the same. "We Are All Unique Individuals" Students will write, create and share with the class why they should include all students, especially people who appear to be different than them. 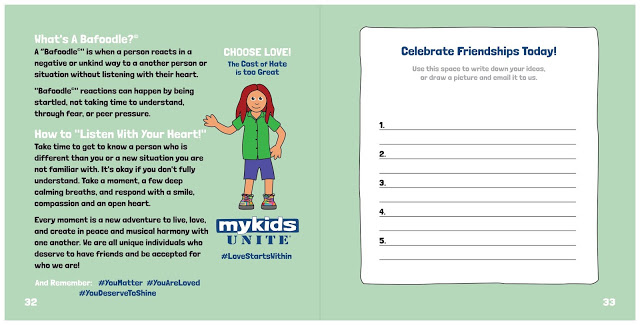 MyKids Unite© Inclusion Lesson Plan is a 7 Page PDF File. May be incorporated as monthly, quarterly or semester inclusion objectives and goals. EBook includes colorful illustrations of the MyKids Unite© Team Celebrating Friendships for All in various activities. Ebook is a EPub File - EPUB files can be opened in most e-book readers, including the B&N Nook, Kobo eReader, and Apple's iBooks app. EPUB files have to be converted before they're usable on the Amazon Kindle. EPUB files can also be opened on a computer with several free programs, such as Calibre, Adobe Digital Editions, iBooks, EPUB File Reader, Stanza Desktop, Okular, and Sumatra PDF. Microsoft Edge, the default browser in Windows 10, features out-of-the-box support for reading EPUB files.